More than 15,000 people visited the Twelve Apostles on Christmas Day, the highest daily number recorded by Parks Victoria. They arrived in more than 3,000 cars, 170 buses and 11 coaches, contributing to a December when around a quarter-of-a million people visited. That monthly figure of 242,000 was 12% higher than last year and 16% higher than two years earlier. With more busy periods expected this summer, particularly Chinese New Year, Parks Victoria will maintain speed limit reductions, roadside barriers and traffic and parking coordination around the visitor precinct. The Chinese New Year festival is the biggest event on Melbourne’s Chinese calendar, featuring two weeks of celebration and festivities. 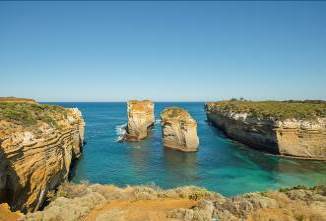 Many families and groups enjoy the holiday by visiting regional Victoria, with the Twelve Apostles being a favourite destination. Last year, more than 128,000 people visited over 15 days. To bolster visitor services, Parks Victoria will have additional staff working throughout the Port Campbell National Park, including Park Rangers with mandarin-language skills. The multilingual Rangers will help Chinese visitors understand more about the coastal environment and how to help protect it by staying on paths, behind lookout barriers, and taking away rubbish. China is Victoria’s biggest international visitor market, with the latest tourism figures showing more than 650,000 people arriving during the year to September 2018, spending $3.2 billion. People visiting the popular Twelve Apostles, Gibson Steps and Loch Ard Gorge on weekends in summer and during the Chinese New Year are encouraged to allow additional time for their trip, observe traffic conditions and follow the direction of Park Rangers. Please remember that speed limit reductions, barriers, remain in place through Chinese New Year.